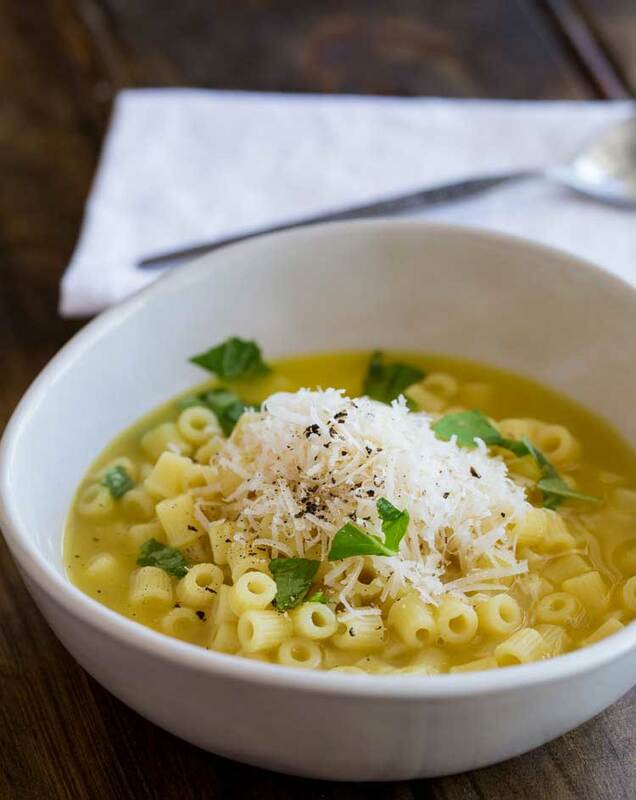 This Pasta with Chicken Broth, Butter and Parmesan is pure comfort food! It is a bowl of wonderful, warming, healing amazingness. One spoonful and you know the world is going to start looking brighter. A whole bowl and you feel restored. This Pasta with chicken broth will become your new favourite simple dinner. Usually when you cook pasta you use plenty of boiling water and keep it at a rolling boil. With this recipe to ensure the pasta packs a flavour punch, you want to use the lowest simmer possible. If the broth/stock starts to boil, it will evaporate out of the pan and there won’t be enough to cook your pasta fully. So use a low simmer and you will be rewarded with a comforting bowl of pasta! The majority of the flavour in this dish comes from the chicken broth (chicken stock) so it needs to be the star of the show. Homemade is best, as it has plenty of flavour and that unctuous richness that cartons can’t provide. There are some great store bought options out there, but bottom of my list would be those crumbly over salty chicken stock cubes. They don’t taste of chicken, have no goodness in them and really will leave you with a below average dish! The dish is Pasta with Chicken Broth; the broth is the key! 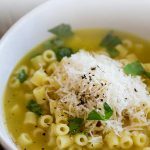 This Pasta with Chicken Broth, Butter and Parmesan is pure comfort food! This is a traditional Italian dish that usually uses pastina, the small star like pasta shapes. I didn’t have them as to be honest they aren’t my favourite, I like pasta with a little more body to it, so I used these super cute teeny tiny tubes. Risoni/orzo would work well too. I actually planned to use risoni but I realised I used it all up in my Tomato Risoni Salad!!! Really it works well with any small pasta shape. Don’t be put off by the butter in this, it is warm and comforting and just so good. You can imagine being sat at an Italian kitchen table, feeling a little under the weathered being served big bowls of this by your Italian Nonna! 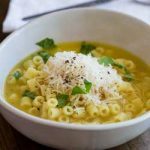 If you love this recipe for Pasta with Chicken Broth, Butter and Parmesan why not pin it for later. Once the pasta is cooked, remove it from the heat and stir in the butter. Use a slotted spoon to divide the pasta between the serving bowls. Add the parmesan, plenty of black pepper and garnish with your fresh herbs. To ensure the 4 cups of broth/stock is enough to cook the pasta and leave you with some to spoon over, you need to cook this over a very low heat. This prevents some of the evaporation. If the mixture boils you will find you run out of stock. If this does happen add some boiling water to your pasta, not too much as you will dilute the wonderful chicken flavour. Now you have read the recipe you will know there is absolutely nothing healthy about this pasta with chicken broth!!! And that is why I love it! That is why I am sharing it and that is why I cooked it! I do not feel well! I just want to get back into bed and sleep. Now this is completely and utterly my own fault! I had a glass of wine or 4 with friends last night and now I am feeling very sorry for myself. I needed food, I wanted comfort food but I also wanted something that didn’t require much effort in the kitchen. Something simple, delicious and most importantly easy to eat because I am not moving from the sofa any more than I have to!!!! So I made my comforting pasta with chicken broth. Pasta with loads of butter and salty stock. Man it made me feel better!!! The key to this killing a hangover is the homemade chicken stock. It does just make the world better. If you don’t have any then use the best quality one you can buy in the store. It really does make a difference. 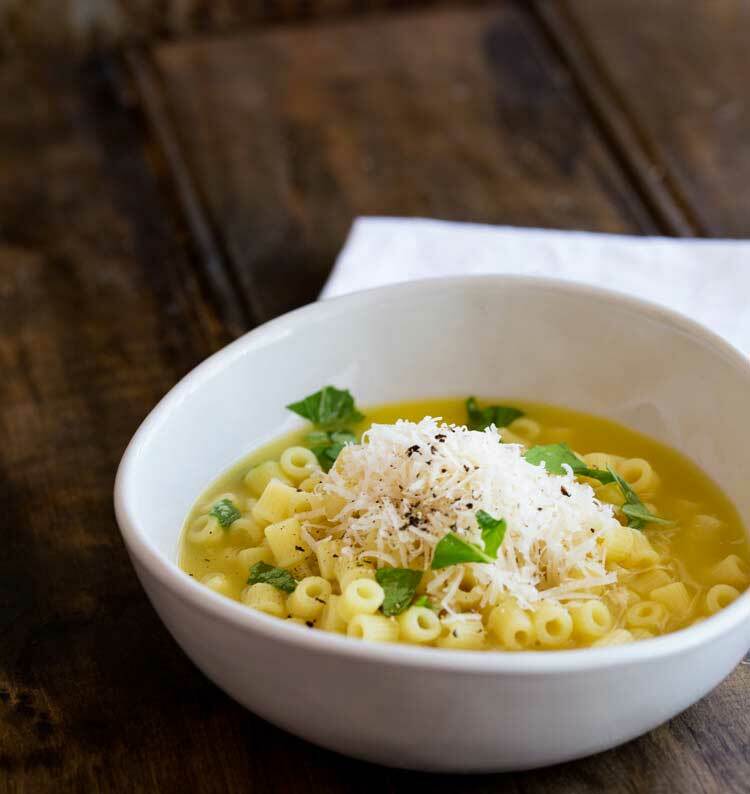 If you love food why not subscribe to my newsletter, I will drop you an email every now and then, just to say hi and send you a couple of recipes think you might love, like this Pasta with Chicken Broth, Butter and Parmesan. Very delicious …thank you for yer yummy recipe…smiles!!!!!! My kids wanted this every time they were sick growing up. 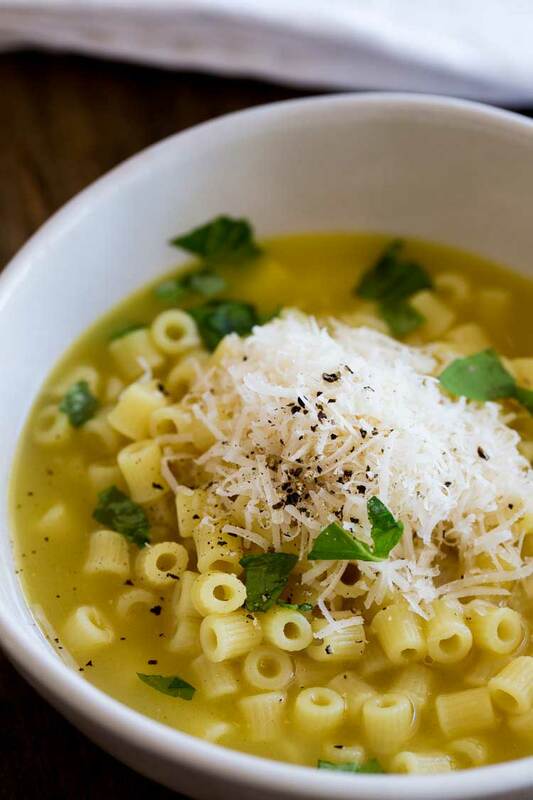 Our version of Italian wedding soup. I have to send my daught pastini nodles in Florida, she can’t find them down there! So good. It really is just the best thing when you are sick isn’t it. I LOVE that you send your daughter pasta, food is the best set of mail to receive! My Noni cooked us capelinni in chicken broth all the time. So good, and one of my favorites. Along with the memories. It really is just the best comfort food isn’t it. i hope you enjoyed the soup. Haha yes my sons loved it. Thank you very much. Brightest blessings to you my dear. 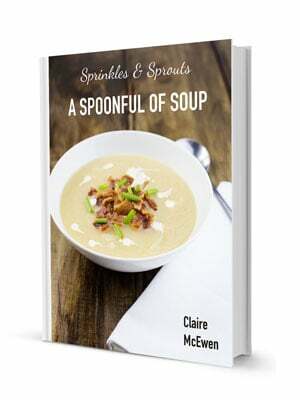 This is absolutely delicious… The best soup I have ever had!! I even add rotisserie chicken. Is this better with broth or stock? Oh I am so glad you enjoyed it. It is one of my favourite comfort bowls. I think stock makes it better as stock tends to be made with bones so it has more gelatin in it and sort of tastes richer. But with the addition of the butter you can still get a rich soup with broth.